Problem-based learning is a student-directed approach to learning. Students are given a real-world problem that cannot be answered with a quick Google search. Students investigate the problem, the various sources of the problem, solutions that already exist and develop novel solutions of their own. This bundle includes three student-directed learning tool kits: scientific open inquiry, project-based learning and problem-based learning. Each tool kit includes all guiding materials needed to get through each type of student-directed learning activity from start to finish such as brainstorming activities, project/problem design templates, reflections and rubrics. 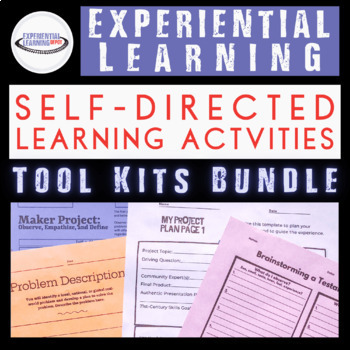 Each tool kit promotes student-designed learning experiences where students ask their own questions and design their own investigations, or you can personalize each activity to fit a specific topic and let students take it from there. All templates included in each tool kit are meant to be generic, so could be applied across disciplines.